Home › › Minimally Invasive / Biomimetic Dentistry › Black is White: Activated Charcoal for Tooth Whitening? 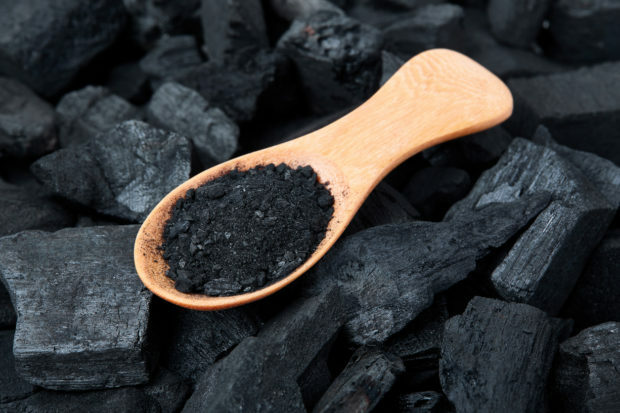 Charcoal becomes “activated charcoal” when it is exposed to high temperatures and combined with a gas or an activating agent, expanding its surface area. The resulting porous material “adsorbs” impurities from its environment. 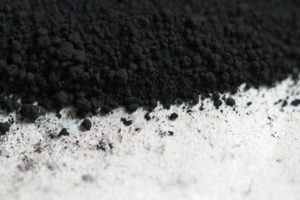 Adsorption is different than absorption–it means that the porous surface of activated charcoal attracts material, kind of like a magnet, purifying its surrounding area. The World Health Organization has listed activated charcoal as an essential medicine for centuries. Since the early 1900s, it has ben used primarily for treating cases of poisoning and overdoses, but is also effective at preventing hangovers, reducing intestinal gas, lowering cholesterol levels, and treating bile flow problems during pregnancy. Its benefits are said to include internal cleansing, weight loss, mold cleansing, as well as promoting skin and body health. Today, we’re here to discuss the tooth-whitening properties of activated charcoal. A few years ago, a YouTube video showed how to use activated charcoal as a toothpaste. Within a few days, it amassed 1.5 million views. Now, when you search the Internet for “activated charcoal for tooth whitening,” there are more than 11,000 video results. Every week, new online fads pop up, but is activated charcoal really safe and effective for brightening and cleaning your teeth? We know that activated charcoal is good for absorbing toxins in the gut. But crushing a tablet, mixing it with water, and brushing your teeth might not be the best way to clean your teeth. The effectiveness of activated charcoal for tooth whitening has yet to be proven in a clinical study. And if you’re simply using activated charcoal–and nothing else–the concern is that the method might not be safe or gentle enough for the surface of your teeth and gingival tissues, or protecting against decay. Activated charcoal adsorbs – not absorbs – surrounding impurities, leaving the area around it cleaner and purer. However, using activated charcoal directly on your teeth is not advised. There is only one toothpaste containing charcoal that appears to be safe: Curaprox® Black is White toothpaste. This jet-black toothpaste uses activated carbon for whitening and stain removal, without bleaching or abrading. It also contains an ingredient that coats the tooth’s surface, providing an additional whitening effect by influencing light reflection. Another property that differentiates this toothpaste from simply using crushed charcoal tablets is that it contains fluoride and nanohydroxyapatite. Studies found that Nanohydroxyapatite particles “were regularly deposited on the cellular structure of the demineralized enamel surface, which appeared to form new surface layers. It was concluded that nanohydroxyapatite had the potential to remineralize initial enamel lesions.” So not only does Black Is White protect against cavities, it helps spark regeneration of lost tooth enamel. Black is White contains ingredients that are known to be effective in preventing tooth decay, and others, which improve the tooth’s appearance. It does not contain sodium laurel sulfate, triclosan, bleaching or chemical agents, or plastic particles–and has a somewhat low relative dentin abrasiveness (RDA) index: 59, compared to the majority of other commercial toothpaste formulations, which have RDAs ranging from 70–190. If you want to go the natural route and use activated charcoal on your pearly whites, ask your dentist about the pros and cons of products like this toothpaste.